One Geek's Blog: WebGL, What is it and How Can I Use it? I'm putting these links at the top for easy access, click here to skip directly to the content. Documentation for my work-in-progress library, WebGLU, is availible here. The current version of WebGLU, v0.1, is available as a single file, webglu.v0.1.js. Sylvester is available from here. Copies of the files used in the tutorial below are available individually tutorial.html, tutorialPage.js; or as an archive. Update: Thanks to Ademan for pointing out that GLSL is not exactly c, but a c-like language, corrected. Update 2: Thanks to Kumar for pointing out that Fragment shaders operate on pixels, not polygons. So, what is OpenGL? OpenGL is a 3D, hardware accelerated graphics API. So, what's so special about WebGL then? WebGL allows website developers to do 3D graphics inside of webpages. WebGL is not a plugin, it is part of the web browser implementation itself. Two modern browsers/rendering engines (Firefox and Webkit) are already integrating support. WebGL is hardware accelerated. Since it's OpenGL it benefits from graphics hardware just like any other OpenGL application. I don't think VRML could do this, at least not by default. What does it take to see WebGL content? As of today you need either to compile and build Webkit yourself and use it with Safari, or you can use the Firefox trunk nightly build. I currently use the Firefox nightly to do my WebGL work in and I have not managed to get Webkit built. As such, any demos and provided code will almost certainly in Firefox and, theoretically at least, in Webkit. Ok, cool, so how do I use it? Well, for the most part, it's brand new, so not much is known about how useful it can actually be, but I've been playing around with it for the past couple weeks and what follows is what I've figured out so far, so it's half tutorial, half explanation of what I've done. To start we need a web page. Simple enough, we only need a few things. First are the scripts we'll be using. We'll also need some special scripts called shaders. Shaders are written in a c-like language that WebGL executes to render our scene. I'll keep them simple since GLSL (GL Shader Language) is a tutorial in itself, but briefly the idea is thus. A vertex shader tells OpenGL what to do with each vertex you give it, and a fragment shader tells OpenGL what to do with each pixel it draws to the screen. A vertex shader can have several attribute variables which are different for each vertex in an 'object' (more on that later) e.g. position and color; vertex shaders can also have uniform variables which are the same for every vertex in an object e.g. how much to rotate or translate, or the position of a light. Finally, vertex shaders can have varying variables, which aren't passed in, but rather calculated and set within the shader, it's how we get data from the vertex shader to the fragment shader. In addition, a shader has code that tells OpenGL what to do with all of these. Next, we'll need the startup function, which will create a timer and recurring call to update(dt) and draw(), which we'll define more fully in tutorialPage.js. Also, we'll initialize WebGLU, a work-in-progress library I've written that we will be using to (I hope) make it easier to work with WebGL. To finish off the page, let's add the canvas we'll be drawing to. Put the webpage in one file, this script in another, and put webglu.v0.1.js and Sylvester in the same folder, open the page in a compatible browser and tada! Here's a static picture of what this demo renders, nothing special, but it's a solid start. To view a live demo, click here. The next tutorial will focus on extending what I've shown here today with animation and input. Further on we'll look at loading images as textures and gracefully handling window resizing. Minor correction - "Fragment shaders" operate on the "pixels" generated from all the geometry - not the polygons assembled from vertices as you say in your post. See Pixel shader on wikipedia. i can't seem to get the examples to work, is there any flag i need to set? Honestly, there are so many discussions about why to and why not to use Flash I just wanted to say there are reasons, and give one example. I am no expert on any of these technologies and am new to web application development, so I make no claims to experience. I just wanted to address the fact that every time I mention what I'm working on someone asks "Why not Flash?" In the end, like any other programming language or framework, both Flash and WebGL are tools, and different tools have their appropriate use, even if it's a Phillips-head versus flat-head screwdriver. So, out of those three advantages, the third is really the true advantage. -- Hardware acceleration. 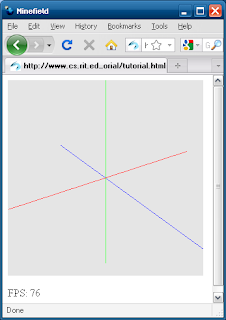 Actually, I used an OpenGL accelerated VRML plugin. The software renderer was startlingly fast on the viewer I used 10 or 15 years ago, I think SGI used hand-optimized assembly code. But it did also support OpenGL if the card did.